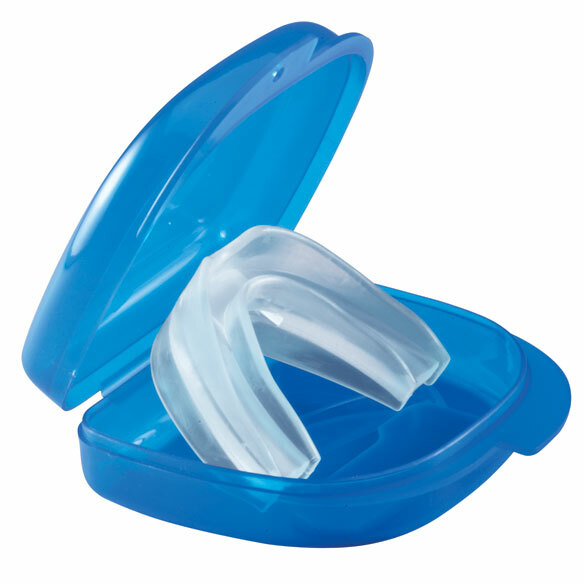 Comfortable, reusable Snore Doctor mouth guard helps promote clearer breathing by gently keeping oral and nasal airways open while you sleep. 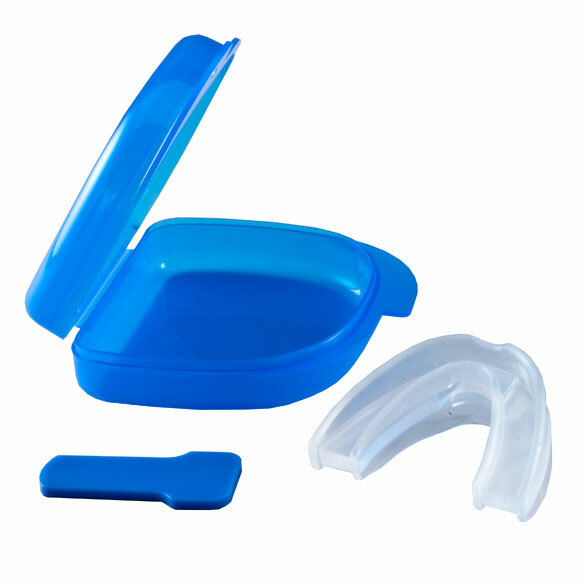 Drug-free, FDA-cleared mouthpiece is ideal for those with apnea, snoring and allergy problems. Includes convenient carrying case and plastic tab for use when cleaning. One size fits all. I thought I would try this before coughing up a large amount for the dentist's version. It is a bit bulky but the vinyl is soft and flexible. I took about a week to get used to it. Started out by using it a couple hours the first night and increased it thereafter. It definitely helps stop my snoring, but sometime I have to take it out in the middle of the night. If I do wear it all night, by morning I can't even tell I have it in my mouth. I guess my mouth acclimates to it. I have a small head and not a large jaw, so I think most people could get used to it. I do have one concern after using it about 3 weeks. It holds the jaw in an abnormal position so I am afraid it might affect my TMJ. For the price, I figure I'll use it until I have a problem with it. I would not buy this item again. It was unusable. There was no way to keep the item in my mouth. There were no directions on usage. I wasted my money on this. Very uncomfortable. I tried trimming it down but that didn't work either. I clench my teeth while sleeping - they hurt in the a.m. I snore so I hope this helps me to let my husband sleep. Just wanted to try it out. My existing tooth piece became to replaced. Wanted to try this method of possible sleep apnea problem. To help with my breathing when going to sleep. This keeps my mouth shut while I use the nasal pillow type C pap. Grind my teeth at night dentist recommended mouth guard. I needed it for sleepy and it was a good price. Looks sturdy and will keep me from grind my teeth. Husband suffers from sleep apnea. Want to try it. Hopefully will give me better sleep nights. To stop snoring without medications. I chose this because my girlfriend has an issue with snoring and she wanted to try this out. I snore but these are too big for me. I have a small frame and my jaws are not big enough. daughter keeps choking on c pap thought this might keep that from helping. does it have to be boiled be used? BEST ANSWER: No, as far as I know. does it rest on your bottom teeth or top teeth? BEST ANSWER: both. Your teeth rest on the spaces provided for teeth on upper and lower. When you bite on it upper and lower teeth rest on the grooves provided. You can breathe thru a hole in the front of the appliance if mouth breathing. Thank you for your question. This sits between your upper and lower teeth when you bite down on it. We hope this information will be of help to you. how does it help sleep apnea? I only have 1 tooth will it still work? BEST ANSWER: Thank you for your question. Unfortunately we do not have a direct answer. It may not work effectively as teeth will help keep it in place and give proper support. We hope this information will be of help to you. How do I make it fit? BEST ANSWER: Thank you for your question. You place the item in hot water for a few seconds, when pliable insert it into your mouth, and bite down to fit, remove the guard and put into cool water to set. We hope this information will be of help to you.